For a calculation I activated the option "detailed calculation". 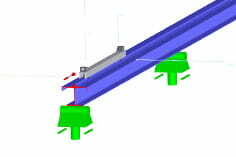 Are the bearing loads already specified with the reduced vibration coefficient for dimensioning the substructure? The support forces will be combined in the same way as the internal forces from the load cases with consideration fo the dynamic coefficients. For this purpose, the bearing forces (except for LF1 and LF2) are multiplied by the ratio of vibration coefficient carrier to vibration coefficient bearing and added according to the LK criterion, since the wheel loads from LF3 already include the vibration coefficient for the carrier. Vibration coefficient for supports (see Figure 5.6).